It’s not fun to have missing teeth, even if it’s just one that’s in the far back of your mouth. Your smile is incomplete and you know it because everyday activities are different. You can’t enjoy the same foods, the gums in and around that area are exceptionally sensitive and exposed to sharp tortilla chips like never before. That’s not the worst of it either. Missing one or more teeth dramatically effects your overall health, too. Before you neglect the care you need for too long, Complete Cosmetic Care Dentistry wants you to consider getting dental implants in Bixby. This cosmetic and restorative dental procedure can truly save your smile and improve your life. Missing Teeth Can Decline the Quality of Your Life! There are many ways that you may end up facing tooth loss face to face. Besides the embarrassing sagging facial appearance that has a heavy aging effect, missing teeth can severely affect the rest of your dental and systematic health. Let’s take a look at which dangers you are facing by missing one or more key components of your smile. You can suffer from gum and bone recession. If your jawbone does not get enough “exercise” from the normal pressures of chewing, it will start to recede and deteriorate. This doesn’t just take place where the tooth once was, but it extends to other areas, putting your other teeth at risk. You leave your body susceptible to infections and diseases. When your gums recede, it exposes access to your blood stream. Bad dental bacteria are already harmful to your mouth, let alone the rest of your body. When dangerous, foreign materials enter your blood stream and have access to your organs, your body’s natural reaction is inflammation. Inflammation leads to systematic diseases like heart disease, increases in strokes, and diabetes. Your other teeth will start shifting. The movement of your teeth affects the so many aspects of your oral health! Your remaining teeth could become crooked or overlapping, making it more difficult to clean. This could lead to tooth decay. Your bite could also change and you may need orthodontic work from your dentist in Bixby to realign your teeth. Finally, your jaws could be affected. You will be at higher risk for TMJ disorder. The loss of even a single tooth can greatly affect your eating habits. Patients dealing with these problems tend to eat easily chewable, digestible, and high-processed foods. Basically, you’re more at risk for food-induced health diseases because these foods are lower in nutritional value. You may not be as confident. Sometimes, some patients experience difficulties just speaking normally, especially if they are missing a part of their smile—especially their front tooth. Dental Implants Can Save the Day! 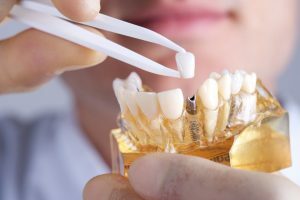 If you’ve been looking for tooth replacement options, many resources may have pointed you to traditional replacements like dentures. This only replaces the visible portion of your tooth. What about the other important half of your tooth—the root? Your tooth root stimulates your jawbone, keeping it full and healthy. Without one, patients experience bone deterioration over time, leading to an increased risk of additional tooth loss or a sunken facial appearance. Thankfully, dental implants replicate the entire structure of a tooth, preserving and encouraging the growth of new bone tissue. Dental implants can help to rejuvenate your entire smile from root to crown. If you’re considering this dental procedure, call us to schedule an appointment with your implant dentist in Bixby!